Figure 1: Scan team in front of Mont Blanc Tunnel firefighting truck. Figure 3: EU pamphlet for motorists in tunnels. Figure 9: German end-of-queue warning vehiclesModel of A86 twin roadway tube: full-size model of one section and scale model of twin tube. Figure 11: Ventilation to support self and aided rescue (FEDRO). Figure 13: Examples from the Mont Blanc Tunnel: tunnel escape route and tunnel escape route sign. Figure 15: LED lights in the Mont Blanc Tunnel: yellow for edge delineation and blue for vehicle spacing. Figure 17: Truck thermal detector at the Mont Blanc Tunnel entrance. Figure 18: " One-button" response for incident management in the Mont Blanc Tunnel. Figure 19: Emergency pullout area across from refuge room in the Mont Blanc Tunnel. Figure 20: Mont Blanc refuge room: inside refuge room and instructions posted on wall. Figure 21: High-tech firefighting trucks for the Mont Blanc Tunnel. The United States has limited guidelines, standards, and specifications related to safety, operations, and emergency response in underground transportation systems. The Federal Highway Administration, American Association of State Highway and Transportation Officials, and National Cooperative Highway Research Program sponsored a scanning study of equipment, systems, and procedures used in tunnels in Austria, Denmark, France, Germany, Italy, Norway, the Netherlands, Sweden, and Switzerland. 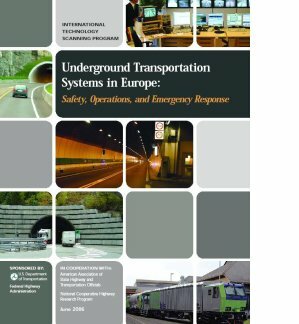 The scan team learned that Europeans are conducting research to develop innovative design and emergency management plans that consider how people react in tunnel emergencies. Because motorist behavior is unpredictable in tunnel incidents, Europeans make instructions for drivers, passengers, and tunnel operators as straightforward as possible to reduce required decisionmaking. The team's recommendations for U.S. implementation include conducting research on tunnel emergency management that includes human factors, developing tunnel design criteria that promote optimal driver performance during incidents, developing more effective visual, audible, and tactile signs for escape routes, and using a risk-management approach to tunnel safety inspection and maintenance. The success of this scan was a result of the knowledge and experience shared by representatives of the host transportation agencies, researchers, associations, and private firms during the scan meetings. Scan team members thank their hosts for their gracious hospitality and for taking the time from their busy schedules to meet and discuss the latest technological developments in their countries. Each country provided information that expanded the knowledge of scan team members, and team members look forward to continued interaction and partnership with the hosts in the advancement of safety, operations, and emergency response in underground transportation systems. The scan team also thanks the Federal Highway Administration (FHWA), the FHWA Office of International Programs, the American Association of State Highway and Transportation Officials, and the National Cooperative Highway Research Program for their leadership and support of the scan. Chris Hawkins Parsons Brinckerhoff Quade & Douglas, Inc. The International Technology Scanning Program, sponsored by the Federal Highway Administration (FHWA), the American Association of State Highway and Transportation Officials (AASHTO), and the National Cooperative Highway Research Program (NCHRP), accesses and evaluates innovative foreign technologies and practices that could significantly benefit U.S. highway transportation systems. This approach allows for advanced technology to be adapted and put into practice much more efficiently without spending scarce research funds to recreate advances already developed by other countries. After a scan is completed, team members evaluate findings and develop comprehensive reports, including recommendations for further research and pilot projects to verify the value of adapting innovations for U.S. use. Scan reports, as well as the results of pilot programs and research, are circulated throughout the country to State and local transportation officials and the private sector. Since 1990, approximately 70 international scans have been organized on topics such as pavements, bridge construction and maintenance, contracting, intermodal transport, organizational management, winter road maintenance, safety, intelligent transportation systems, planning, and policy. Increasing traffic congestion in urban areas and growing land values in the United States make underground structures increasingly attractive for highways and transit compared to other options. A tunnel can preserve the land above for parks, buildings, homes, and other uses while providing an efficient, cost-effective underground corridor to move people and goods. Unfortunately, only limited national guidelines, standards, or specifications are available for tunnel design, construction, safety inspection, traffic and incident management, maintenance, security, and protection against natural or manmade disasters. An 11-member team was formed to study European practices on the aforementioned topics. This team consisted of three representatives from the Federal Highway Administration (FHWA), four representatives from State departments of transportation (DOTs), one representative from the Bay Area Rapid Transit District (BART), one representative from the Massachusetts Turnpike Authority who also represented the International Bridge, Tunnel, and Turnpike Association (IBTTA), one tunnel engineering design consultant, and the report facilitator. The scan was sponsored by FHWA, the American Association of State Highway and Transportation Officials (AASHTO), and the National Cooperative Highway Research Program (NCHRP). During late September and early October 2005, the team visited Denmark, France, Norway, Sweden, and Switzerland. In addition, the team had meetings with representatives from Austria, Germany, Italy, and the Netherlands. These countries were selected on the basis of desk scan findings that showed they are innovators in underground transportation systems. The objectives of the scan were to learn what is being done internationally for underground transportation systems in the areas of safety, operations, and emergency response. Tunnel systems and designs that provide fire protection, blast protection, and areas of refuge or evacuation passages for users. Arrangements of the various components to maximize their effectiveness, assure inspectability and maintainability, and promote cost savings. Tunnel operations, including incident detection and deterrent technology, and incident response and recovery planning. Specialized technologies and standards used in monitoring or inspecting structural elements and operating equipment to ensure optimal performance and minimize downtime during maintenance or rehabilitation. Regarding the safety and security aspects, the team was interested in learning about planning approaches, standards, manpower roles and responsibilities, communication techniques, and state-of-the- art products and equipment used to deter, detect, deny, defend, respond to, and recover from both natural and manmade disasters and other incidents. Team members were interested in not only tunnel practices and innovations for highways, but also those for passenger and freight rail. Team members identified a number of underground transportation system initiatives and practices that varied from those in the United States in some respect. The team recommended that nine of these initiatives or practices, briefly described below, be further considered for possible implementation in the United States. Little was discovered related to the threat from terrorism to underground structures, perhaps because of the confidential nature of this information or the lack of perceived need for such measures. The scan team learned that the Europeans consider response and safety measures already in place for crashes and other incidents to also be applicable for many terrorist actions. The Europeans are doing extensive research resulting in innovative design and emergency management plans that consider how people react in tunnel emergencies. Because motorist behavior is unpredictable in tunnel incidents, Europeans make instructions for drivers, passengers, and tunnel operators as straightforward as possible to reduce required decisionmaking during an incident such as a tunnel fire. The nine initiatives and practices listed below relate to human factors, planning, design, and incident and asset management. The scan team noted that the signs Europeans use to indicate emergency escape routes are consistent and uniform from country to country. Emergency escape routes are indicated by a sign showing a white-colored running figure on a green background. Other signs that indicate the direction (and in tunnels, the distance in meters) to the nearest emergency exit also have the white figure on a green background, as used in European buildings and airports. All SOS stations in the tunnels were identified by the color orange. This widespread uniformity promotes understanding by all people, and helps assure that in the event of an emergency, any confusion related to the location of the emergency exit will be minimized. In addition, the team learned that combining the use of sound that emanates from the sign, such as a sound alternating with a simple verbal message (e.g., " Exit Here" ) with visual (and, where possible, tactile) cues makes the sign much more effective. The U.S tunnel engineering community relies on National Fire Protection Association (NFPA) 130, Standard for Fixed Guideway Transit and Passenger Rail Systems, and NFPA 502, Standard for Road Tunnels, Bridges, and Other Limited Access Highways, for fire protection and fire life safety design standards. These standards should be reviewed and revised as necessary to incorporate the most current technology and results of recent human response studies on identification and design of escape portals, escape routes, and cross passages. Single-source guidelines for planning, design, construction, maintenance, and inspection of roads and bridges have been in place for many years. NFPA has developed standards for safety in highway tunnels and passenger rail tunnels. The American Public Transportation Association (APTA) has general safety standards and guidelines for passenger rail operations and maintenance that incorporate some of the NFPA standards by reference. However, AASHTO does not have standards or guidelines specifically for highway or passenger and freight rail tunnels. Recently, the AASHTO Subcommittee on Bridges and Structures created a new committee, the Technical Committee on Tunnels (T-20), to help address this problem. T-20 should take the lead in developing AASHTO standards and guidelines for existing and new tunnels, working with NFPA, APTA, FHWA, and the appropriate TRB committees on standards and guidelines for highway and passenger and freight rail tunnels. T-20 should consider tunnel safety measures such as the Mont Blanc Tunnel emergency pullout area and variable message sign showing maximum speed limit and required vehicle spacing, as well as refuge room requirements. Tunnel design solutions may not anticipate human behavior, and consistently predicting the way people will behave in an incident is not easy. During emergency situations, human behavior is even harder to predict as the stress of the situation replaces intellect with curiosity, fear, or even panic. During a tunnel emergency, people often must be their own first rescuers and must react correctly within a few minutes to survive. Tunnel emergency management scenarios and procedures must take human behavior into account to be fully effective in saving lives. The European experience in human factor design provides a good basis for the United States to discover and include more effective measures for tunnel planning, design, and emergency response. During an emergency situation, most people do not immediately know what to do to save themselves and others. Motorists are their own first rescuers, and European studies indicate that self-rescue may be the best first response for a tunnel incident. For this to be an effective strategy, it is important to educate the public about the importance of reacting quickly and correctly to a tunnel incident, such as a fire. The scan team learned of sophisticated software that-using a computer system interfacing with ordinary video surveillance cameras- automatically detects, tracks, and records incidents. As it does so, it signals the operator to observe the event in question and allows the operator the opportunity to take the appropriate action. This concept can also be applied to detect other activities and incidents in areas besides tunnels, including terrorist activities, crashes, vandalism and other crimes, fires, and vehicle breakdowns. The Europeans found that innovative tunnel design that includes improved geometry or more pleasing visual appearance will enhance driver safety, performance, and traffic operation. For example, the full-size model of one section of the twin roadway tube for the A-86 motorway in Paris demonstrates the effectiveness of good lighting and painting to improve motorist safety. It is a particularly important consideration for a tunnel roadway section designed with limited headroom. Tunnel designers should evaluate the materials and design details that are incorporated to reduce risks to ensure that they do not pose other unacceptable hazards. For example, paint used to enhance the visual experience should not produce toxic fumes or accelerate fire. The European scan revealed that one of the most important considerations in responding to an incident is to take action immediately. For this to be effective, the operator must initiate several actions simultaneously. An example of how this immediate action is accomplished is the " press one button" solution that initiates several critical actions without giving the operator the chance to omit an important step or perform an action out of order. On the Mont Blanc Tunnel operations center control panel, operators can initiate several actions by moving a yellow line over the area where a fire incident is indicated on a computer screen. This " one-button" action reduces the need for time-consuming emergency decisions about ventilation control and operational procedures. The Europeans observed that tunnel operations personnel have difficulty keeping up with events like tunnel fires, and they believe that an automatic system using devices like opacity sensors can help determine the correct response. A closed-loop data collection and analysis system that takes atmospheric conditions, tunnel air speed, and smoke density into account may best control fans and vents. The scan team learned that some organizations use a risk-based schedule for safety inspection and maintenance. Through knowledge of the systems and the structure gained from intelligent monitoring and analysis of the collected data, the owner can use a risk-based approach to schedule the time and frequency of inspections and establish priorities. It makes more sense to inspect less critical or more durable portions of the system on a less frequent basis, and concentrate inspection efforts on the more critical or more fragile components. A risk-based assessment of the condition of facilities also can be used to make optimal decisions on the scope and timing of facility maintenance or rehabilitation. This method offers a statistical process to manage the tunnel assets. The scan team noted that in several European tunnels, light-emitting diode (LED) lights were installed along the edge of the tunnel at regular intervals of approximately 10 to 20 meters (m) (33 to 66 feet (ft)) to clearly identify the edge of the roadway. These lights were either white or a highly visible yellow color. In some tunnels, spaced among these edge-delineation lights were blue lights at 150-m (490- ft) intervals. Motorists are instructed through formal (for truck and bus drivers) and informal driver education to keep a safe distance between them and the vehicle in front, and that distance is indicated by the spacing of the blue lights. This visual cue is more reliable than asking motorists to establish distance between vehicles using speedbased guidelines, such as maintaining one car length spacing for every 16 kilometers per hour (10 miles per hour) of speed. The LED markers are also less susceptible to loss of visibility because of road grime and smoke during a tunnel fire. The scan team has developed a detailed implementation plan for the nine recommended initiatives and practices. Included in the plan are a number of technical presentations and written papers at national meetings and conferences sponsored by FHWA, AASHTO, and other organizations to disseminate information from the scan. Also included in the plan is coordination with AASHTO, FHWA, NFPA, and APTA to advance these initiatives and practices, including assisting with the development of AASHTO standards and guidelines for highway tunnels and passenger and freight rail tunnels. Considerations for outreach to the public include the development of brochures and radio and television announcements. These and other planned activities are discussed in Chapter 3.